It time for a little DIY! ONVIA VEDO S2 is a GSM / SMS wireless and full-featured home security alarm system with the technology from Korea. We can install the alarm system ourselves in just a few minutes. It can deliver years of dependable and secure protection. Plus its advanced wireless technology eliminates the hassle of running wires to detect and sensors. This important as we don’t want our beautiful home to look flaw with those wires running plus it allows for quick and easy installation as well as flexible placement around the house. Unboxing the ONVIA VEDO S2 Wireless Alarm System now, the here is the basic package that is retail at RM799. It consists of 1 control console, 2 remote control, 1 door magnetic sensor, 1 motion detector, 1 power adaptor, 1 quick start guide and 1 user manual. The extra optional accessories can be purchased separately at affordable prices. 5. 2 wired zone specially for smoke/gas/vibration/detector, with IR beams. I like the overall outlook of the set with attractive sleek design. The control console is slim, light and modern design in off-white; which can be fitted into any corner of our home stylishly. We have done the unboxing and now it’s time to start installing and use it. As I mentioned before this is a very easy DIY home alarm system you can complete it within 15 minutes referring to the Quick Start Guide. Plug in the power cable on the back of the control console and insert a regular SIM card with credit into the VEDO S2, download the mobile app OnviaVedoS2 from App Store or Google Play. Please take note that ONVIA VEDO S2 alarm control by app does not need wifi, 3G or LTE. All you need is a normal SIM care for call in or out communication. If you use supplementary SIM card and the downloaded mobile app, communication is free. Meaning there will be no extra data charges. You have remote control of the system at your fingertips via text messages or the mobile app. The ONVIA VEDO S2 Wireless Alarm System has 2-Way Audio feature that we can use to talk. We not only can you listen to what is happening inside your house when we are outside of our home we can speak into the system as well. This can actually scared the robbers or guide your kids or family members on what to do in case of emergencies. By using a supplementary SIM card and the downloaded mobile app, communication is free as in no extra data charges will be applied. When the alarm system is triggered, you will get a call and a message. You will also get system status messages for power outage, power back up and low batteries. The zones name can be customized by user accordingly. The location can be easily recognized. It can store up to five phone numbers. 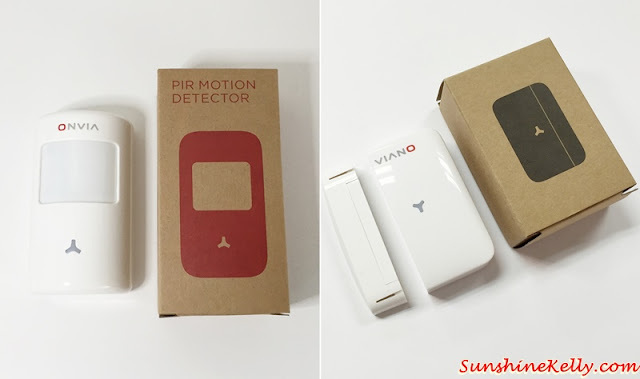 In the package there are 1 motion detector and 1 door / window magnetic sensor but I think I need more of these for security purposes r maybe I am kiasu. But not to worry, the additional accessories can be purchased separately at affordable prices. The great thing is that there is no wire required to connect the sensor to the control console. Everything is so seamless and wireless because the sensors come with the pre-programmed original kit. All I need is to install or place the sensors and detectors at the spot I want. I can have up 50pcs sensors. As you know most robbers will enter the house through the back or kitchen door. So I ensure I have the door sensors and motion detector on whenever I am not in. One the door is open the light on the magnetic sensor will on and it will trigger the alarm. Not only that we also have to install the same in the main entrance as well. The ONVIA VEDO S2 Wireless Alarm System provides for 24 hours, day and night protection for home and family. Plus this alarm system offers free mobile application that enables me to control and configure the system easily via my smart phones whenever or where ever I am is not an issue anymore. Finally I downloaded ONVIA VEDO S2 Mobile App on my smart phone. It is free download and available in App Store or Google Play. Next is to signed in or add account and now I can control plus view the system in anywhere using my smart phone. 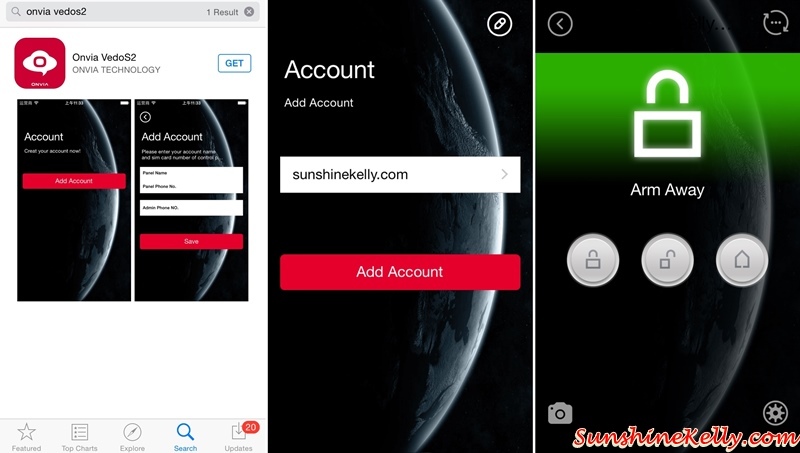 Overall, the mobile app control and system is very user friendly and easy to use. Then key in the phone numbers so when the alarm trigger it will send sms so our phone. 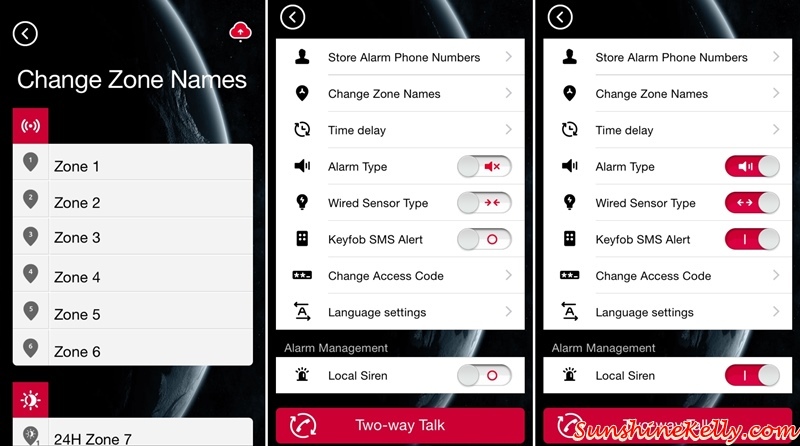 We can customize the alarm system using the mobile app, such as change the zone names, alarm management, Keyfob SMS alert and many more. I can have the full access to my home alarm system via my smartphone. This is so cool and easy for people on the go like me. Overall, the ONVIA VEDO S2 Wireless Alarm System at Home is definitely easy to install, reliable, wireless and affordable. I like the compact and sleek design that fit into any type of home décor. The installation part is fast and fuss free. 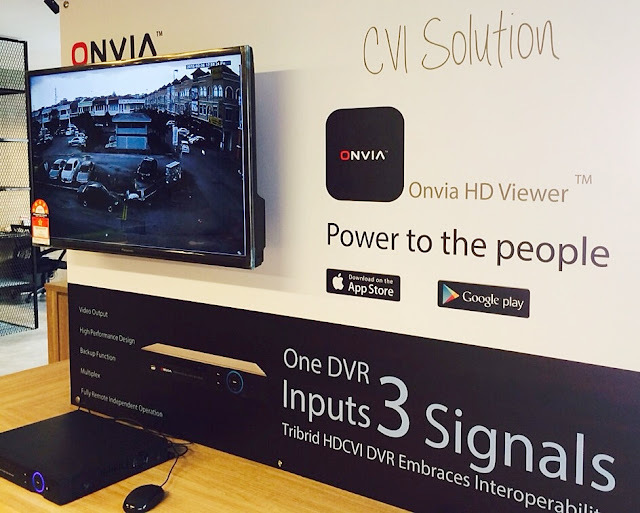 The best part its wireless and I can control via my smartphone through Onvia Vedo S2 mobile app. Last but not least, the price is affordable for most of us, ONVIA VEDO S2 Wireless Alarm System is retail at RM799 for the standard package. Alright! If you are looking for a reliable, sleek with hassle free wireless alarm system; do check out and purchase the ONVIA VEDO S2 Wireless Alarm System from SECUREMART, Bandar Puteri, Puchong. To locate Securemart Puchong, just key in Securemart CCTV in google map or waze and you'll be able to locate it easily. Address: 62, Jalan Puteri 5/12, Bandar Puteri, 47100 Puchong, Selangor. For more information please visit SecureMart-Puchong Facebook Page & Website. Do you have any security or alarm system at home? f not, perhaps you might need to invest one at home for the peace of mind. This is awesome. I haven't tried installing something like this at home. But it would be great to have this, for extra protection. The alarm looks handy and easy to install. No doubt, you'll feel safer with this. This looks very interesting indeed. I hope a product like this can reach our country as well. Maybe it has, but I have not heard about it. I will check local availability of this product. We don't have an alarm system at home, none has in my area. But this is actually great to have. Safety should also be one of the priorities. I just don't know if this is available here. For the last few months I've been thinking about CCTVs & Security systems. Thanks for this review. This looks useful! For moms like me, this really is a must have. It would feel more secured to have a cctv with me at home especially now that I already have 2 kids. Alarm systems are important. Its best for making us feel more secure. At least, we can sleep better at night. Wow! This is a product and a muat have for any homes. Great security features. It looks really convenient since it's wireless, and looks very sleek! I think I need that since security is an issue in my neighborhood.